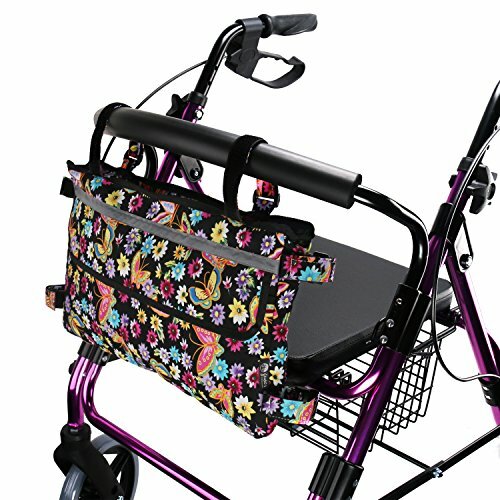 TOMMHANES AMISGUOER Walker Bag for Walker and Scoote 15.7"X9.8"
1.Design of adjustable HOOk&LOOP stripe Free paste and length adjustment that is easy for use; suitable for multiple walking aids. 2.Light reflection design that safety when walking at night Reflective stripes in front and back, which take effect under light and safety when walking at night. 4.Diversified article placing to accommodate your belongings, such as wallet, keys, bank cards, business card, beverage, snack, glasses, cell phone and other daily supplies. Walker Swivel Wheel with Sure Glide Brake Wheel Size: 5"